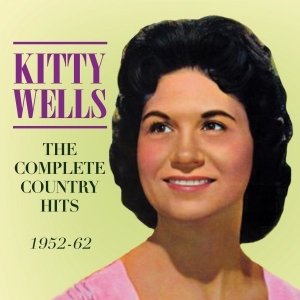 Kitty Wells was the first female country artist to establish herself as a major hitmaker in the genre, and paved the way for the many female artists who made their names in the ‘60s and ‘70s. After making No. 1 in 1952 with “It Wasn’t God Who Made Honky Tonk Angels”, she racked up a consistent string of hits over the next ten years, including several more No. 1s, to the extent that she earned the nickname of “The Queen Of Country Music”. Her highly distinctive, pure and plaintive voice lent itself admirably to the core repertoire and style of country in the ‘50s, and some of the top male artists of the time gave their own careers a lift by recording duets with her. This great value 49-track 2-CD set comprises every record by Kitty which made the US country charts during the decade following her debut hit, including B sides that charted and the previously mentioned duets which also charted. She continued to have hits and was a fixture on the country scene for several more decades, but the hits she scored during this first key decade represent her most important contribution to the genre as well as being an enjoyable slice of classic country music.